In a not so surprising move, Real Madrid has continued its asinine culturing of sacking it's coaches with the sacking Rafael Benitez. The former Valencia and Liverpool manager has been let go after just seven months in charge of the Spanish giants. 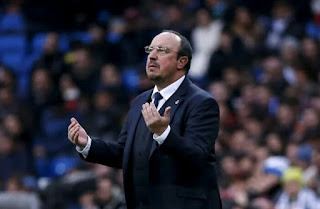 Rafa Benitez had failed to live up to the astronomical lofty ambitions that President Florentino Perez had set for his team, such ambitions has seen managers such as the Champions league winning manager Carlo Ancelotti and José Mourinho sacked after a barren season. Rafa's record at Real Madrid stands at 17 wins, 5 draws and 3 losses after 25 games. His sudden departure can be traced to their elimination from the Copa Del Rey and domestic form where they stand four points adrift from their eternal rivals Barcelona.